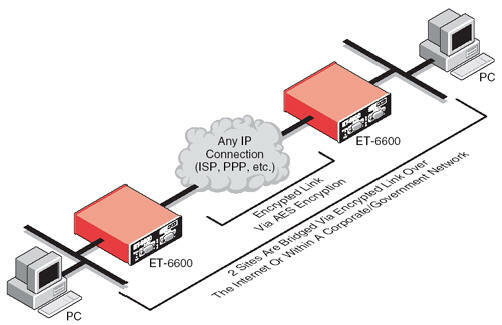 The ET-6600 creates an encrypted tunnel which passes Ethernet packets between two trusted LANs. All Ethernet protocols are bridged between two units. The ET-6600 only operates in conjunction with other ET-6600 units. One unit is required for each location. Multiple units may be connected to the same host unit. The ET-6600 encrypts data between private networks using the public Internet or any other network as the transport. The ET-6600 is an industrial temperature rated device for creating encrypted Ethernet tunnels. It features two serial ports and two Ethernet LAN ports. For example, you can take your office notebook computer home and connect securely to the office, just as though you were still there, and do this through the Internet. Use the same IP address at home and at the office. If both the office and the home have broadband, large amounts of data can be moved very efficiently. Dial-up is slow, as is all dial-up. The ET-6600 adds just milliseconds to the data propagation time. The ET-6600 uses 128 bit AES encryption. AES is the Federal Government standard selected using an open selection process to replace DES and 3DES encryption. For Ethernet to Ethernet connections, the 10BaseT connection is the untrusted side, or the Internet. The 10/100 Ethernet is the trusted, or internal side of the unit. For Ethernet to Serial connections, the serial port becomes the untrusted side, the 10/100 Ethernet is trusted side. One unit is required for each location. Multiple remote units may be logically connected to the same host unit. The ET-6600 operates through firewalls with only one TCP port of your choice opened. It bridges all Ethernet protocols including IPX, IP, Netbuei, and other proprietary protocols. It is straight-forward, easy to configure and maintain. 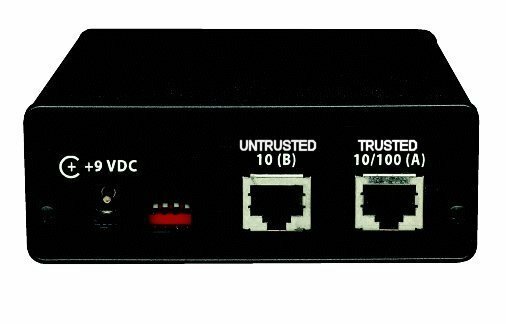 The EP-6600 has the features you want without the complexity, expense, and overhead of standard VPN products and protocols. Medical – AES encryption of the ET-6600 meets HIPPA requirement for securing data over open networks such as the Internet. The medical industry is mandated by HIPPA to meet HIPPA privacy and security requirements over open networks. Real Estate – Connecting to and updating the database of listed homes. Field sales personnel working out of the home, hotel rooms wired for high speed Internet access. Remote office with more than one device, with the ET-6600 shared with switch or hub.